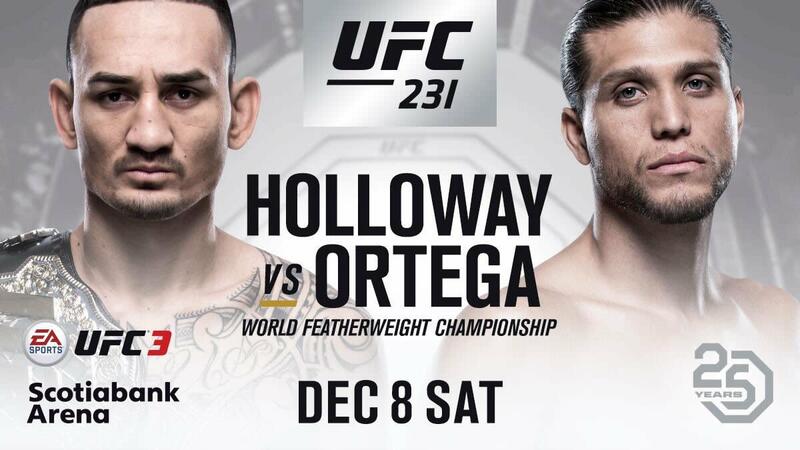 As has been rumored and discussed for several months, UFC featherweight champion Max Holloway vs. top challenger Brian Ortega has been signed for December's UFC 231 in Toronto, Canada. The fight initially was supposed to happen at July's UFC 226, but Holloway had to medically pull out of the fight in the days leading up to the event after showing concussion-like symptoms. There was some concerns that it was tied to weight cutting, raising issues about Holloway's health and future in the sport. Holloway is on a 12-fight win streak and has one successful defense of the title he won a piece of in 2016 in an interim title victory over Anthony Pettis. He is coming off back-to-back victories over Jose Aldo. Ortega is undefeated and has finished all of his seven UFC opponents since he debuted for the promotion in 2014. He was last seen knocking out Frankie Edgar in the first round in March. As of now, UFC 231 will feature a co-main event of Valentina Shevchenko vs. Joanna Jedrzejczyk for the vacant UFC women's strawweight title, Jimi Manuwa vs. Thiago Santos, and Eryk Anders vs. Elias Theodorou.